Take a walk down memory lane..."The Soda Fountain"
"The Soda Fountain," by Gia Giasullo and Peter Freeman, is a fabulous hardcover book that shares stories, vintage advertisements, fun facts and recipes that can be recreated at home. This fond American tradition is revisited and brought alive for the reader with beautiful pages to read through, or to browse through when you only have a few minutes to relax. I love hearing stories and seeing pictures from past eras and the soda fountains have always been so appealing to me and I absolutely adore this book! It is one that I will keep out within easy reach at my house so I can pick it up and page through it time to time and it will be one that guests will see and have to pick up to look through. The recipes all sound delicious as well and there is a nice variety of recipes included in this book as there are recipes for various syrups, a section of float recipes and even a section devoted to baked goods. I highly recommend this book to those whom enjoy taking a little walk down memory lane or whom want to revisit an American tradition; this book is filled with recipes to help kick off the summer! *"I received this book for free from Blogging for Books for this review." Alex Marestaing's novel, "I'm Nobody: The Lost Pages," is a well-written, thought-provoking, intricate story that is perfect for both young adults and older adults as well. Alex has woven together a story of a boy Caleb, whom is grieving the loss of his older sisters years earlier, and whom struggles with some mental illness issues. Iris remembers Caleb in second grade and her interactions with him at this time and she is curious about why she has not seen him since. As Caleb tries to unravel the mysteries in his life, the reader is able to go on this journey to help him figure out what is real and what is not. This novel is one of those books that will stick with the reader long after it is finished and it is one that will be reflected upon and help the reader do some personal soul-searching. I enjoyed this book and would recommend it for young people to read whom may be struggling with issues in their own lives. "While Love Stirs" is Lorna Seilstad's latest novel and takes the reader back into the lives of the Gregory Sisters, this time focusing on the middle sister Charlotte, although all three girls are a part of the book. Charlotte has graduated from the Fannie Farmer's School of Cookery and she is ready to take on the world from her kitchen. However, not her own kitchen in her home, but a kitchen where she can cook for others. As Charlotte meets resistance because she is a woman, she begins to feel defeated until she is offered a job with the gas company to travel and give lectures and teach women how to cook with using a gas stove. During this time as well Charlotte is trying to make changes in the hospital as she is appalled by the food that her sister Hannah is given after giving birth to her daughter. However, it seems that every time Charlotte has contact with Dr. Joel Brooks they are in disagreement and Charlotte is not taken seriously. However, there is no denying the sparks between them. As Charlotte travels she is spending a lot of time with Lewis whom sings before her lectures; Charlotte enjoys his company, so why does Joel continue to occupy her thoughts? I really enjoyed "While Love Stirs!" I have enjoyed all of Lorna's books that I have read though! The Gregory sisters are such fun characters to spend time with and they are independent, spunky, and loveable. Aunt Sam is a wonderful character as well and also is Molly whom is a perfect traveling companion to Charlotte. I am looking forward to continuing on Tessa's journey with her in the third book of this series! I highly recommend Lorna's books to historical romance fans as she has unique settings and storylines with loveable and fun characters! DAISIES ARE FOREVER | Enter to win a Kindle HDX from Liz Tolsma! I read and loved Liz' novel, "Snow on the Tulips," and was looking forward to reading another World War II story written by her, and I have thoroughly enjoyed "Daisies are Forever" as well. Liz does an incredible job with writing these stories as she brings to life the time period and the characters as well as the horrific events they come face to face with. Gisela has strength that I could only hope to have if I were her and faced with the choices and situations that she is forced to deal with. Gisela's compassion also shines through as she sets out on this journey with her elderly neighbors and her cousin's daughters while having to leave her cousin and grandfather behind. Mitch won me over right away from his bond with his buddy and also how he is there for Gisela and the children as well as the ladies even though their marriage is a masquerade. This book is filled with tragedy, but hope and love shines through in the little moments and through the amazing characters whom you cannot help but admire, empathize with and love (although I could never warm up to Kurt!). This is a very well-written historical romance and I am looking forward to many more books from Liz, as she has found her way onto my list of must-read authors! Guideposts Books is excited to announce the premiere of a new film based on the book Love Finds You in Sugarcreek, Ohio (Summerside Press) by Serena Miller. The movie, produced by Mission Pictures International and filmed last fall in the actual town of Sugarcreek, will premiere on Sunday, June 1, 2014 at 7:00 PM EDT on Up TV (formerly the Gospel Music Channel). Visit the movie website for more information. The story: A mysterious outsider casts a long shadow on Ohio's Amish country. Policewoman Rachel Troyer has always looked after her three elderly Amish aunts, proprietors of a farmhouse inn near Sugarcreek, Ohio. The idyllic town is popular with tourists, who come to sample its famous Amish goods. But one thing is clear to Rachel --- Joe Matthews is no tourist. When the bearded stranger lands on her aunts' doorstep, begging shelter for himself and his young son, Rachel is suspicious. Will she be able to uncover Joe's secrets despite her aunts' --- and her own --- growing affection for him? About the author: Prior to writing novels, Serena Miller wrote for many periodicals, including Woman's World, Guideposts, Billy Graham's Decision Magazine, Reader's Digest, Focus on the Family, Christian Woman, and The Detroit Free Press Magazine. She has spent many years partnering with her husband in full-time ministry and lives on a farm in southern Ohio near a thriving Amish community. This book is an excellent addition to this series and I am looking forward to seeing the movie! Serena does an excellent job with bringing the characters to life and engaging the reader in the characters' lives. Rachel is such a wonderful main character and I love her relationship with her aunts and how protective she is of them and the town. I loved the interactions between Joe and Rachel and their journey toward moving forward from the past and finding love. This is a well-written story that will draw the reader in on the very first page. I enjoy reading Shelley Shepard Gray's novels as she has a style of writing that is so easy to get into and it feels as if I come to be a part of the story, and her latest novel, "Thankful," is no exception. Christina and Aden started out as neighbors and friends; friends whom had a crush on each other. When Aden's parents were killed in an accident, Christina's parents took in Aden and raised him as a son; however Christina and Aden, unbeknownst to each other, do not think of each other as a sibling, they are in love with each other. This book is a sweet love story that touches on many relationships of various types and the resounding theme throughout the book is being thankful. This is a quick read and one that Amish fans and fiction fans in general will enjoy. "Snack Girl to the Rescue! : Easy, delicious food for breakfast, lunch & dinner," by Lisa Cain, founder of Snack-Girl.com, is an excellent book filled with ideas and recipes for those whom are trying to eat healthier. This book is so much more than a cookbook, it is a realistic guidebook for losing weight, making healthier choices in regards to eating and attempting to lose weight along with recipes. Lisa uses language and terms that are easy to understand and shares recipes that are easy to make and one will not want to be making up excuses as these all sound delicious! I am excited to incorporate several of these recipes into my weekly menu planning! To read the press release click here! To learn more about Lisa click here: Lisa! "The Loving Kitchen" is a wonderful collection of recipes that LeAnn Rice has compiled in a beautiful book filled with photographs to go along with the recipes. There is a section of breakfast foods, a section of bread recipes, a section for soups and sandwiches and a section for desserts, among others. LeAnn shares a remembrance or a little side note with each recipe that she has included in this book that makes this cookbook so personal. Cinnamon scones, baked crab dip, cheese overland macaroni and cheese, apple-cranberry chutney, and chocolate peanut butter cream pie are just a few of the many delicious recipes that are included and ones that I cannot wait to make and enjoy. None of the recipes seem overly difficult and they require common ingredients; this combination results in delicious food to share with family and friends. I love Cathleen Armstrong's A Place to Call Home series! I loved book 1 and her latest, book 2, "One More Last Chance." Sarah has come home to Last Chance after graduating to college; she is ready to teach 2nd grade, live in her own home and be free from a boyfriend whom she thought she would have been engaged to by now. Chris, the new owner of the Dip 'n' Dine, is ready to mix things up a little bit, but it does not appear others feel that way, including Sarah. As Chris finds himself caring for his seven year-old niece, Olivia, Sarah cannot help but be drawn to Olivia and also Chris. As these two seek to find their way in Last Chance and in life in general, they learn to seek guidance from God and those around them whom care in this town they call home. I was so happy to have a chance to return to Last Chance with Cathleen as I loved her first book and now I am eager to read book 3 coming out next spring! Last Chance is filled with lovable characters and I was thrilled that Elizabeth played such a prominent role in the story again and I loved the relationship between her and Sarah and loved that Sarah chose to live just 2 houses down from her grandmother. I loved the scene where Sarah walks down with her mug of tea seeking her grandmother's guidance and wisdom following her time with Chris and needing to sort out her feelings in regards to both Brandon and Chris. I have to admit I was not a fan at all of Kaitlyn at all, but I warmed up to her and found myself feeling sorry for her (good thing since she is the main character of book 3!). Chris is an incredible brother to Kaitlyn and an excellent owner of the Dip 'n' Dine and he jumped right into that role well. I enjoyed his interactions with Carlos and the great team he and Rita make with planning the fiesta. I highly recommend this series to those whom enjoy Christian contemporary romance fiction! USA Today best-selling author Tricia Goyer has written the novelization to the much-anticipated movie, Moms' Night Out. Don't miss this hilarious family comedy that celebrates real family life—where everything can go wrong and still turn out all right. And, look for the companion devotional written by comedian Kerri Pomarolli, Moms' Night Out and Other Things I Miss: Devotions To Help You Survive. Tricia and Kerri have teamed up for the "No More Frumpy Mommy" challenge. Motherhood can sometimes seem like survival of the fittest. Every day brings its own troubles, and by the end of the day, you’re spent. Between school, soccer practice, cleaning, laundry, cooking dinner, putting away dishes, and keeping your kids from going at each others’ throats, the last thing on your mind is getting away for an evening. If that’s you, you’re invited to take part in Tricia and Kerri's No More Frumpy Mommy challenge. Tricia and Kerri will choose 10 winners to receive a Fandango gift card to see Moms' Night Out, as well as copies of Moms' Night Out (the book) and Moms' Night Out and Other Things I Miss. One grand-prize winner will receive $200 to put toward her own moms' night out or her own moms' night out "ride" (getting her car detailed and cleaned). USA Today best-selling author Tricia Goyer is the author of over 35 books, including the three-book Seven Brides for Seven Bachelors series and Lead Your Family Like Jesus (co-written with Ken Blanchard). She has written over 500 articles for national publications and blogs for high traffic sites like TheBetterMom.com and MomLifeToday.com. She is the host of Living Inspired, a weekly radio show. Tricia and family live in Little Rock, Arkansas. They have six children. The Moms' Night Out film features Sarah Drew (Grey's Anatomy), Sean Astin (THE LORD OF THE RINGS), Patricia Heaton (EVERBODY LOVES RAYMOND, THE MIDDLE), Alex Kendrick (COURAGEOUS), Robert Amaya (COURAGEOUS), Andrea Logan White (REVELATION ROAD), Kevin Downes (COURAGEOUS), and platinum-selling country recording artist Trace Adkins (THE LINCOLN LAWYER). I absolutely love this book and devotional book!!! I began reading the book and on the very first page when Allyson is typing her blog post and is distracted I could completely relate...and began to think about all I had to still do...and then refocused and kept reading! :) This is a book that was fun, so fun to read, but yet thought-provoking as I could relate to so much throughout it and yet also at the same time comforting as I was reminded that I am not alone. The devotional book is great and is one that I will take my time going through many more times as they are short, sweet and inspiring. Both of these books are must-read and must-have for every mother, seriously they are going to have permanent homes on my bookshelves but will not be on the shelf too much as I am sure that they will be read often, if only a few pages at a time for an escape and a reminder of God's grace and that I am not alone in the everyday busyness that goes hand in hand with being a mom. I have loved every book in Dani Pettrey's Alaskan Courage series and the latest one, book #4, may be my favorite one (so far!)! "Silenced" starts out with Kayden and Piper enjoying a day climbing along with a little bit of their friendly competition going on, but it turns deadly when Kayden discovers a dead climber. Things turn sinister as Kayden and Jake are teamed up to solve this case as suddenly Kayden is being targeted. Now that Jake's past has been revealed he is no longer hiding his secrets and Kayden is getting to know the real Jake and her feelings are scaring her as she is hesitant to care and be vulnerable. As the family joins together to find the one behind the threats, they all rely on each other and find strength in each other in the maze they are in. Dani has done an excellent job as this book is fast-paced, full of twists and turns, and wonderful characters. I loved that I was kept guessing for most of the story and I did not want to stop reading, so I stayed up way later than I should have just to find out who it was behind everything! I loved that the McKenna siblings were all back in Alaska for the weddings and that it seems as if Reef may be staying! Looking forward to book #5, which I am assuming will focus on Reef?! I highly recommend this book and entire series (which you must read in order!) to every fan of romantic suspense! 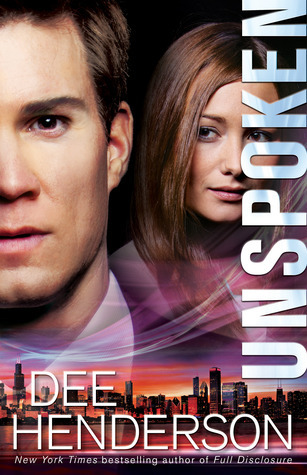 I have been a fan of Dee Henderson's novels even since I read my first one by her and she did not disappoint with "Unspoken." Charlotte was kidnapped and held captive for four years. In the years following this time, Charlotte has done her best to move on, including changing her identity and refusing to share details of her captivity. However, this may not last as a book is being written about this kidnapping. Charlotte met Bryce while selling some coins to him in his shop and she enjoys time spent with him; however Charlotte is very guarded, with good reason to be. However, can Charlotte learn to trust and open her heart and share her secrets with Bryce and can she ever fully rely on and trust God? I was immediately intrigued by this book when I read the description of it and I was not disappointed. Charlotte has had a horrific past and is struggling to cope with this and protect herself and others as well from this horrible period of her life. I felt myself empathizing with Charlotte and wishing at the same time that she would share her thoughts. I also loved Bryce, he was a great character and I enjoyed seeing the relationship develop between he and Charlotte beginning with the coins that she had inherited. I enjoyed spending time once again with Dee's characters. 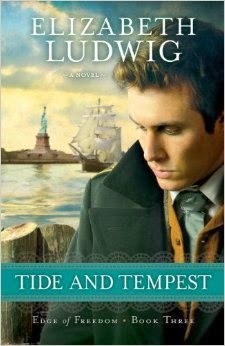 "Tide and Tempest," book three in Elizabeth Ludwig's Edge of Freedom series, is an excellent edition to the series and a great return to New York City and this time period. First of all, I highly recommend that you read the books in this series in order and do not just dive on in to these book as it is the third in the series (as much as you may like to!). You will learn about Tillie in the previous book and I love to have all the details to the story. Tillie lost her fiancée abroad ship traveling to America and Captain Morgan has not been able to forget her and her anguish over the death of her love. When he learns that Tillie's fiancée's death was a murder he is compelled to be in contact with her; however neither are prepared for what all this news entails and what those responsible for the death have planned. I really enjoyed this book! I love the New York City setting and this time period as so many are arriving full of hopes and dreams. There is suspense and turns that keep the story moving along and the reader turning the pages. I also really liked the characters and felt like I was drawn right into their lives, both Tillie and Captain Morgan are excellent main characters. I am looking forward to what this author writes next! $200 “Women Helping Women” Shopping Spree Giveaway from Quilts of Love | “A Promise in Pieces” Giveaway! About the book: A baby quilt touches many hearts as it travels from family-to-family and through generations. After the end of World War II, Clara Kirkpatrick returns from the Women's Army Corp to deliver a dying soldier's last wishes: convey his love to his young widow, Mattie, with apologies for the missed life they had planned to share. Struggling with her own post-war trauma, Clara thinks she's not prepared to handle the grief of this broken family. Yet upon meeting Mattie, and receiving a baby quilt that will never cuddle the soldier's baby, Clara vows to honor the sacrifices that family made. Now a labor and delivery nurse in her rural hometown, Clara wraps each new babe in the gifted quilt and later stitches the child's name into the cloth. As each new child is welcomed by the quilt, Clara begins to wonder whatever happened to Mattie---and if her own life would ever experience the love of a newborn. Little does she know that she will have the opportunity to re-gift the special quilt---years later and carrying even greater significance than when it was first bestowed. About the Author: Emily Wierenga is a former editor, ghostwriter, freelance writer and staff journalist, a monthly columnist for The Christian Courier, and the author of Save My Children (Castle Quay Books, 2008), Chasing Silhouettes (Ampelon Publishing, 2012) and Mom in the Mirror (Rowman & Littlefield, 2013). Emily resides in Alberta, Canada. This is her first novel. "A Promise in Pieces" is a sweet story that I loved and enjoyed every page of! Clara is determined to fulfill the wish of a dying soldier and yet she is unprepared for what she encounters. Clara is given a baby quilt which she faithfully uses and with this quilt there is sorrow and loss, yet there is also hope and love. I love the symbolism tied to the baby quilt and the feeling of hope that is woven throughout this story. I really enjoyed Clara's story and journey and am looking forward to reading more from this author in the future. "Fatal Exchange" is book 2 in Lisa Harris' Southern Crimes series and I really enjoyed book 1, but I think I loved this one even more! Emily is content being a schoolteacher and has no intention of getting involved with a man whom is in law enforcement. However, Emily nor her family are prepared for Mason to become involved in their lives once more due to his past involvement. As Mason and Emily work together in the midst of a situation, they must face and deal with past issues in order to move on in their lives, but most importantly they must work together in order to get through this crisis alive. I enjoyed spending more time with members of the Hunt family and am looking forward to book 3. This is a fast-paced novel that hooks the reader immediately and I wanted to just keep reading as I had to find out what was going to happen with the situation and between Emily and Mason. I loved both Emily and Mason as main characters and they both have things to work through in their own lives and they make a wonderful team! I highly recommend this series to fans of romantic suspense! 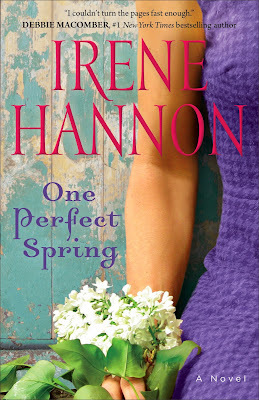 Irene Hannon has brought us another great story with her latest novel, "One Perfect Spring." This book revolves around a letter that eleven year-old Haley wrote asking for a gift for her neighbor, Dr. Chandler; however this is just not any gift, it is to find the son whom she gave up for adoption years ago. As the letter arrives on David and Keith's desks, these two men became involved with Claire, Haley's mother, and Dr. Chandler, these four individuals get to know each and their lives intertwine because of this letter. Never before has their been a spring like this and each of their lives will be forever changed. I loved this story! It is fast-moving, completely engrossing and has some twists and turns along the way. I loved all of the characters and loved that the story is told from various viewpoints. Forgiving ourselves and moving on from our pasts can be so difficult and the ability and freedom to do this is such a beautiful message that is shared in this book. I highly recommend this book for contemporary romance fans! I was so excited to see "The Chopped Cookbook!" and I was even more excited when I came home from work to see it waiting for me! One of my sisters introduced me to Chopped in December and I was instantly hooked on it as I loved everything about the show - having a basket of seemingly random ingredients and having to create something delicious and pleasing to the eye from them. So many days I will stand looking in my kitchen thinking what am I going to make from this and I am thrilled to have so many ideas at my fingertips! there is a section devoted to pastas, another to vegetables and one all about salads. The very first section is a description of the Chopped pantry and then a list of staples for our home pantries. I love this list and addition to the book as it is a great list and very helpful for using this book, but cooking in general. "The Chopped Cookbook" is a hardcover book filled with colorful illustrations and pictures of each recipe and a wide variety of food to make, so what are you waiting for - go see what's in your basket! Go here to read more about this awesome cookbook: Chopped! Kindle HDX Giveaway! Richard Mabry's latest medical suspense, Critical Condition, is receiving high praise. USA TODAY says, "Mabry combines his medical expertise with a story that will keep you on the edge of your seat." About the book: Dr. Frasier couldn't save the gunshot victim on her front lawn. Now she's fighting for her own life. About the Author: A retired physician, Dr. Richard Mabry is the author of four critically acclaimed novels of medical suspense. His previous works have been finalists for the Carol Award and Romantic Times Reader's Choice Award, and have won the Selah Award. He is a past Vice-President of American Christian Fiction Writers and a member of the International Thriller Writers. He and his wife live in North Texas. "Stress Test" was the first novel by Richard Mabry and that hooked me on his books! "Critical Condition" was fantastic and I am already looking forward to Richard's next book! The book's prologue dives right in with Shannon's life forever changing and then the action just continues on in the very first chapter. A man is shot on Shannon's lawn and this leads to her life taking a turn once again and then it seems that this is the beginning of a downward spiral with trials with other family members and bringing back memories from the past. I loved this book and felt as if I could not read fast enough, yet at the same time I was sad to have the story end. Richard does an incredible job with bringing his characters and their situations to life as he ties in medical terms, and situations and his medical expertise is evident through his writing. Shannon and Megan were both great characters and ones that I enjoyed spending time with. This is a book that is completely engaging from the very beginning to the very end. I highly recommend this book to those whom enjoy suspense. War changes everything . . . even their love. Bride-to-be Stella Carson can't wait to marry her longtime sweetheart Marshall Henderson. But Marshall has been away serving his country and has suffered a head wound. After being diagnosed with post-traumatic stress disorder, he has distanced himself from Stella, asking her not to visit him in a Washington, D.C., hospital. Marshall returns to Louisiana just four weeks before the wedding, but as the big day draws near, Stella wonders if the man she's loved for most of her life has become someone else. Can true love conquer all for Stella and Marshall, even the tragedy of war? Lenora Worth has written a great addition to this series with her novella, "An April Bride." War is so real and the effects of war are so real and Lenora does not tiptoe around this. Stella is thrilled to be marrying her best friend and true love, they have always been the perfect couple. However, Marsh has been injured and does not remember his life, much less Stella. Can they go through with this even though the love and memories that they have made and shared are not remembered? I enjoyed this story and I especially loved the minor characters in this book. Don't get me wrong I really liked Stella and Marshall, but I felt as if the minor characters really made the story and all play vital roles. One part of the story that stood out to me and I reread it and reread it again and highlighted it is during Stella's conversation with Myrtle when Myrtle tells Stella that she had to fire two workers and she is going to do her best to pull off the catering of the wedding how she wanted it to be. This leads to Stella pouring her heart out to Myrtle and Myrtle tells her "What you need to aim for isn't perfect, baby doll, You need to aim for the best you can do. Because that's all you can do, any day of the week. You just do the best you can do and let the rest work itself out." This was exactly what Stella needed to hear and honestly it was something I needed to as well and it is something that I will be rereading many more times. I highly recommend this year of weddings series and enjoy spending this month with Stella and Marshall in their beautiful hometown.